New York - A new voice recorder from Norris Communications of Poway, Calif., could open the door to a tapeless digital audio format. The unit, called Flashback, employs a solid-state system that will eventually be able to store up to two hours of digital audio on miniscule cells. 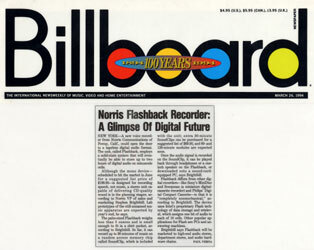 Although the mono device -- scheduled to hit the market in June for a suggested list price of $199.95 -- is designed for recording speech, not music, a stereo unit capable of delivering CD-quality sound is in the planning stages, according to Norris VP of sales and marketing Stephen Brightbill. Lab prototypes of the still-unnamed music apparatus are expected by year's end, he says. The palm-sized Flashback weighs less than three ounces and is small enough to fit in a shirt pocket, according to Brightbill. So far, it can record up to 30 minutes of music on a random access memory chip called SoundClip, which is included with the unit; extra 30-minute SoundClips can be purchased for a suggested list of $69.95, and 60- and 120-minute modules are expected soon. Once the audio signal is recorded on the SoundClip, it can be played back through headphones or a one-inch speaker on the Flashback, or downloaded onto a sound-card-equipped PC, says Brightbill. 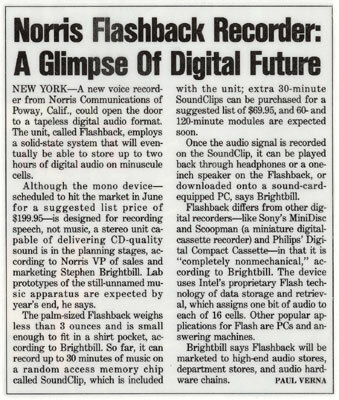 Flashback differs from other digital recorders -- like Sony's MiniDisc and Scoopman (a miniature digital-cassette recorder) and Phillips' Digital Compact Cassette -- in that it is "completely nonmechanical," according to Brightbill. The device uses Intel's proprietary Flash technology of data storage and retrieval, which assigns one bit of audio to each of 16 cells. Other popular applications for Flash are PCs and answering machines. Brightbill says Flashback will be marketed to high-end audio stores, department stores, and audio hardware chains.